The Bible and Hunger - Farmers and Hunters Feeding the Hungry - Hunt Down Hunger! 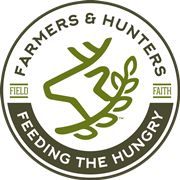 ​Farmers and Hunters Feeding the Hungry was started by founder Rick Wilson in response to a roadside encounter with Jesus in the form of a mother loading a deer to feed her children. While watching her drive away, Rick remembered the words of Jesus from Mathew 25 - "I tell you the truth, when you did it to one of the least of these my brothers and sisters, you were doing it to me!" ​There are many wonderful people and organizations working to feed the hungry. Some do it because it makes them feel good. Others may have been taught by parents and teachers that it is good to share things with others who are less fortunate or have fallen on hard times. ​But the greatest motivation for helping others is because we are loved by a God who created us, provides for us, and gave everything to rescue us from sin and death. A God who has asked us to love and take care of others just as he loves and takes care of us! God speaks a lot about hunger in the Bible. Physical hunger will always be with us and it's clear that God wants us to take care of those who suffer. Spiritual hunger is also common. Some people even try to address their spiritual hunger by doing good things -- like feeding the hungry. But the Bible makes it clear that our spiritual hunger will only truly be satisfied by God himself when we place our trust in his only son Jesus Christ who is able to forgive our sin and give us new life. If you'd like to know more please contact us! We'd love to help you address the problem of physical hunger in your community through FHFH. And if you find you are suffering from spiritual hunger, we'd like to help you find the answer to that problem too! ​“The Salvation Poem” is reprinted with the kind permission of The Salvation Poem Foundation, Inc., the copyright owner. It was originally published in 2004. © Copyright 2004 Matt and Sherry McPherson.